Ethan's still been eating but, as has been occurring, I've been a little delinquent in posting my Ethan's Eats features. 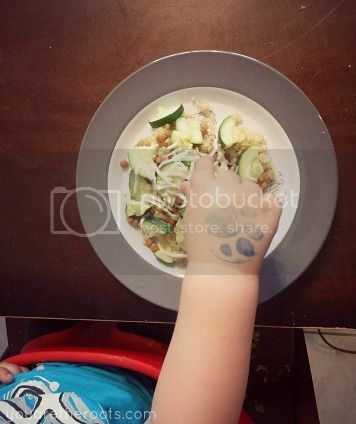 Sometime over the past couple of months, lunchtime has turned into a chaotic mess of little hands wanting to help, toddler impatience and a mommy who just can't remember to snap photos before serving lunch to my hungry little boy. I'm working on it! 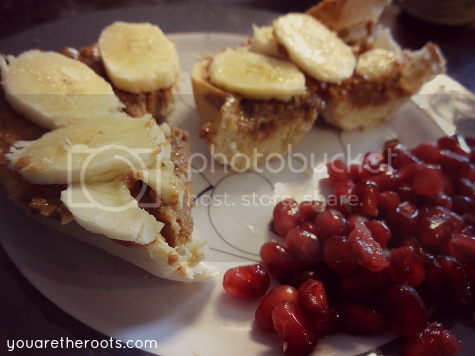 In the meantime, here's an (albeit a bit delayed) installment in Ethan's Eats! This one is a fairly simple dish that doesn't take much time to prepare. 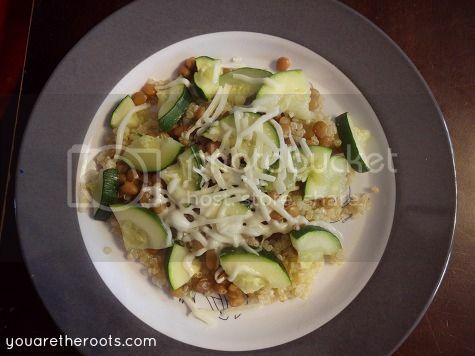 It's simply quinoa, lentils and organic steamed zucchini tossed with a little bit of black pepper, garlic and lemon juice and topped with cheese. I love making quinoa in big batches because it's perfect to turn into nuggets later on throughout the week! Are you familiar with Wild Squirrel Nut Butter? I picked up some of the single-use packets at the health food store the last time I was there and they've been a big hit with Ethan. He loves the chocolate sunflower seed almond butter which I added to toasted bagel half and topped with banana slices. I served this alongside pomegranate arils which he's just crazy about lately. 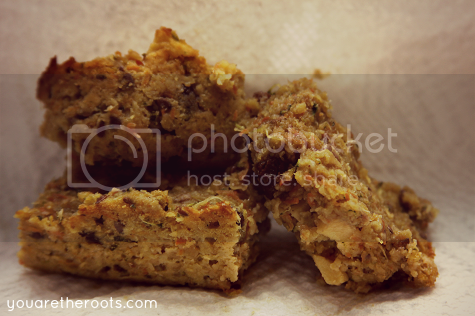 These chewy, healthy snack bars were a huge hit. They have a soft and chewy consistency, almost cookie-like. A batch churns out a whole lot of them, which are perfect for storing and grabbing healthy snacks on the go. These were our go-to snacks the past couple of weeks. Here's what you need: 2 carrots, 1 small yellow squash, 1 apple (peeled), 2 cups of oats, 1/4c melted coconut oil, 2 eggs, 1/2c honey, 1 tablespoon flax seed, 1/2 teaspoon cinnamon, 1/8 teaspoon allspice, 1 teaspoon wheat germ. To make these, grate (I used a handgrater) or puree your carrots and squash in a bowl. Hand grate or food process about half of the apple and chop the other half into tiny, bite sized pieces and add to the bowl with the carrot and squash. Add the rest of the ingredients to the bowl and combine until sticky. Press batter into an 8x8 lightly greased baking dish. Bake at an oven preheated to 375 degrees for 35 minutes. Ethan loves these organic button mushrooms as they make a pretty great finger food for little ones. You'll need: one ripe Roma tomato, an avocado, wheat germ, black beans, cumin, chili powder and your little one's favorite cheese (we used provolone). For these, twist the stem off of your mushrooms, brush the caps with organic olive oil and place in a glass baking dish. In a mixing bowl, combine 1/2 can blackbeans with 1/4 teaspoon wheat germ, 1/4 teaspoon cumin and 1/8 teaspoon chili powder. Smash up some avocado and stir it into the black bean mixture. Press mixture into mushroom caps and bake at 375 degrees for 25 minutes. 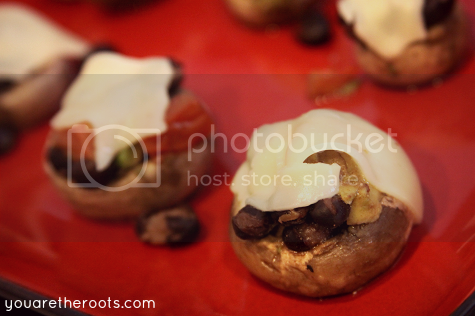 Remove from oven and top each mushroom with tiny pieces of Roma tomato. Top with cheese and place back in oven for 5-7 minutes, or until cheese is melted. I first saw these on Wannabe Green and loved the idea! These were so simple to make and Ethan loved helping to make them. You use your favorite corn tortillas and slice them into "chip" shape using a pizza cutter. We brushed both sides of the chip very lightly with organic olive oil (Ethan loved "painting" the chips). We topped ours with some black pepper and then baked them at 350 degrees for 15 minutes. 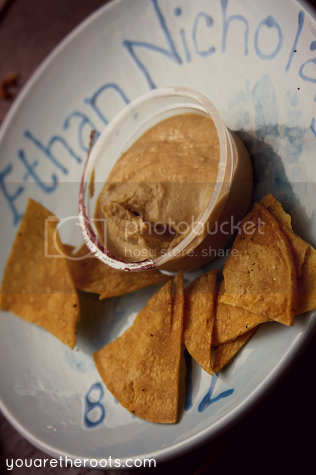 Ethan loved dipping these in hummus as an afternoon snack or with his lunches throughout the week! Yogurt pairfaits have been a common theme for breakfasts and lunches over here the past couple of weeks. Actually, there was one night last week when Ethan also had one for dinner! 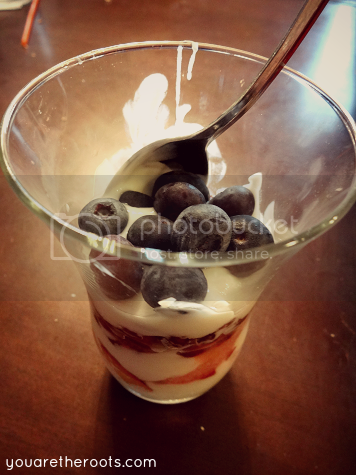 We make ours using Stonyfield Organic's YoBaby Simply Plain yogurt. 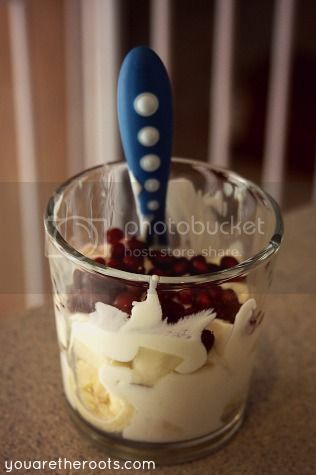 One little yogurt container is just the perfect amount for a toddler-sized parfait! Pictured are parfaits made up of banana, apple and pomegranate arils (top) and plum, pomegranate arils and blueberries -- Ethan's favorites. We also made a citrus style parfait earlier in the week using orange slices and pineapple. The possibilities are endless and Ethan loves helping to make these! YuM! i want to eat all that! Lucky little guy with such a good momma! I love that you share this sort of stuff on your blog Lindsay. It all looks delicious! Ethan's Eats is one of my favorite features. I'm going to try making the snack bars egg-free. We have had trouble lately getting our little guys to eat their veggies, so this will be great. The mushrooms look fabulous too! Thank you so much for posting (and including directions)! I would like to make the healthy snack bars, but am a little confused. Do I cook the carrots and squash first?